For any of you lovelies with plans to visit The Metropolitan Museum of Art in the future, be advised that yesterday there was an increase in the recommended price of admission to $25 for adults, $17 for seniors, and $12 for students. It had been $20, $15, and $10, respectively. It is the first price increase in 5 years. Children under 12 are admitted for free and there are never additional fees to see any of the special exhibitions the Met is showing, such as Alexander McQueen: Savage Beauty. The museum will be open July 4, 2011, from 9:30 a.m. to 5:30 p.m., as one of the Met Holiday Mondays. I can only hope that in the future I will need this information! (BTW...I am following you on Twitter!!) Thanks for your sweet comments on the blog! If I go back to New York one day, I do hope so. I shall let you know, and creat magic together over a cup of soffee. You had me in tear with you comment. It is amazing how you connect, feel and are touched by people you have never met. Enjoy your long holiday, my dear Jill. Do you do or eat anything special??? I pre-purchased my ticket for a few weeks time to see the McQueen exhibit...glad I did...still a pretty fair price for a most excellent museum!! I loved that McQueen collection! That crimson cloak - what a creation! Hi Pam, I hope you get a chance to visit the Met someday soon. And yay for Twitter! I'm finding it more addictive than I expected. Thanks for following me. I went looking for you and my other blogging friends right away! One day I want to visit this museum, with you as my guide. What a beautiful, beautiful cloak. Hi Sacramento, I really hope we get to meet in person someday. It's easy for me to connect online with people who are so honest and generous, even if we haven't met face to face! As for the 4th of July, I always make a blueberry pie, try to have barbecue and potato salad, and see some fireworks! Hi NYC, thanks for stopping by, how ARE you? I need to visit your blog and find out what you are up to. If you pre-purchased your ticket before July 1 you got the nice price ($20). Still, I'm with you, $25 is not bad if you plan to spend the whole day in the museum. It's hard to know where to start in that museum, there is so much to see. 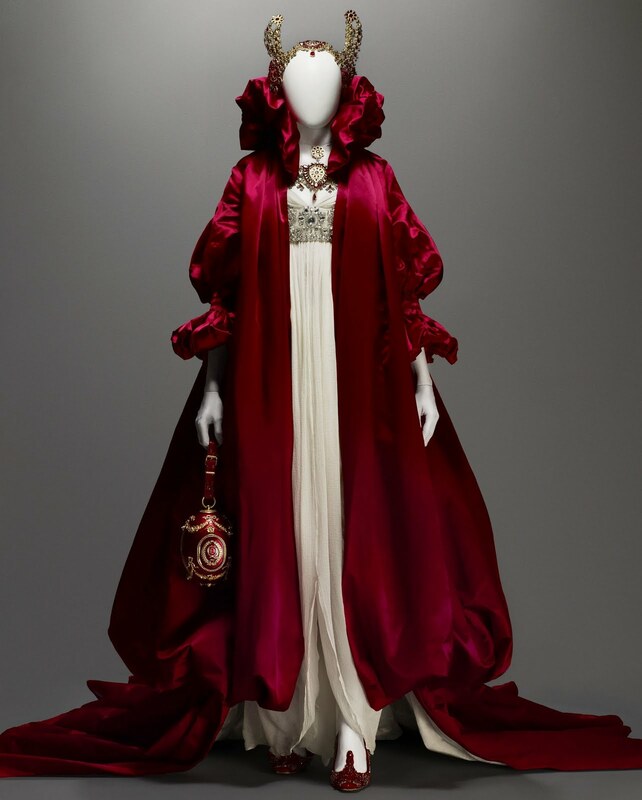 When will you visit the McQueen exhibit? Hi Veshoevius, I will continue to post pictures of the McQueen exhibit on the blog through August 7. I think I could do a whole post on the tartan and lace dresses alone. Love them! And yeah, the red cloak is a beauty, isn't it? Hi Terri, I would love to be your Met guide. We would have the best time! It's so wonderful there, it really is one of my favorite places in NYC.